Preparation time: 12 minutes. Cooking time: 10 minutes. Remove stems, seeds, and cores of the red and green peppers. Cut each into long thin strips. Peel onion, remove ends, and cut in half. Quarter onion and slice into thin pieces, separating them. Spray a large skillet with a thick layer of nonstick cooking spray, and heat over medium-high heat. Add canola oil and garlic. Sauté quickly, then add peppers and onions, stirring frequently. Once the peppers are beginning to soften, add shrimp, salsa, and lime juice. Stir rapidly to heat ingredients evenly, about a minute. Remove mixture from heat. Spread 1 cup sliced lettuce on each of four shallow salad bowls or plates. Place ¼ of the shrimp mixture on each of the lettuce beds. Distribute cilantro equally on tops of each salad. Crush the tortilla chips in a small plastic bag with your hands to make irregularly sized crumbs. Sprinkle chip crumbs on top of each salad. Garnish each serving with a dab of hot salsa, if desired, and serve. 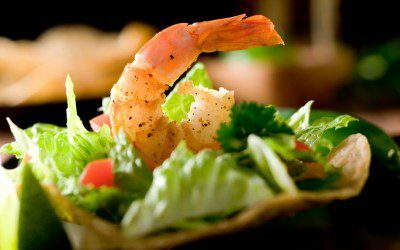 Serving size: 1 cup lettuce, 1 cup shrimp mixture. Exchanges per serving: 1 starch, 3 lean meat. Carbohydrate choices: 1.